It is part of a wider investigation into corruption in Sri Lankan cricket. Jayasuriya, who retired in 2012, is a former chairman of selectors. "This conviction under the code demonstrates the importance of participants in cricket co-operating with investigations," said Alex Marshall, general manager of the International Cricket Council's (ICC) anti-corruption unit. "Compelling participants to co-operate under the code is a vital weapon in our efforts to rid our sport of corruptors. These rules are essential to maintain the integrity of our sport." Jayasuriya was player of the tournament when Sri Lanka won the World Cup in 1996 and he scored 21 centuries and took 323 wickets in 445 one-day internationals. He also averaged 40.07 runs in 110 Test matches. 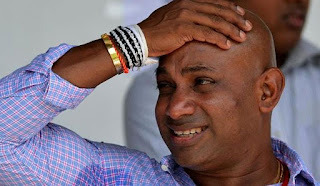 Jayasuriya was charged after he failed to provide a phone and SIM card to the investigation when requested to. "It is clear that there were no corruption charges, betting charges or misuse of inside information charges levelled against me," he said in a statement. "I decided to admit the said charges at the first instance for the love of the cricket, for the greater good and to protect the integrity of cricket. "I reiterate the fact that I have always maintained a high degree of integrity throughout my cricketing career." In September 2017, Marshall asked Jayasuriya to hand over any mobile phones after being "satisfied" they might contain information that could help with the wider investigation. The next day he recalled he had two other phones which had been "lost" after they fell from his pocket "in a grassy area somewhere in Colombo". He then later admitted one of those phones was in fact deliberately "trashed" when he was under stress - however he did not know that the number had rung when investigators tried to call it. His lawyer told investigators: "This is only one mistake he has done. Whether it's a mistake or a lie, or being untruth or violation, you will have to decide." In January, the ICC held an unprecedented 15-day amnesty as part of its investigation into corruption in Sri Lanka. Failure to report an approach, incident or information can result in a ban from cricket of up to five years, but those who came forward during the amnesty with information on corrupt conduct, which they had previously failed to report, would not be charged. The ICC said 11 players and "other participants" came forward with new information. "I am very grateful to those who participated in the amnesty and, as a result of the information shared, we now have a much clearer picture of the situation in Sri Lanka and our investigations are continuing," added Marshall.